In part, Sherman-Associate Professor of Sociology at The New School for Social Research-attributes this reluctance to her subjects' often-ambivalent relationship to wealth. The 50 New York parents she interviewed over the course of this multi-year study all belong to the top five percent of earners, meaning that they bring in more than $250,000 per year, and the majority are in the top one or two percent. Some benefited from substantial inheritances, which in several cases in excess of $10 million. Sherman chose to focus on people in their 40's and 50's who were embarking upon home renovation projects, given that such undertakings provide occasions for intentioned thinking about consumption and lifestyle choices. The project has roots in Sherman's longtime interest in structures of inequality in the United States and in the evolution of her thinking over the course of two previous ethnographic projects. A subsequent project, on the “lifestyle management” industry, focused on people whose job it is to facilitate clients' consumption. Participant observation and interviews allowed her to see behind the scenes of lifestyle production, as she helped personal concierges do errands, oversee renovations, and even buy gifts on behalf of their clients. 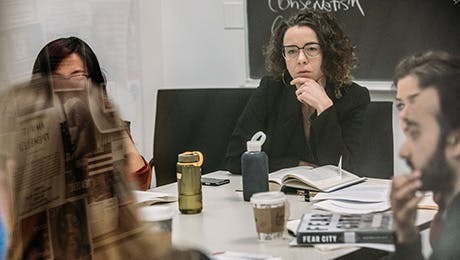 In Uneasy Street, the questions of how wealthy people choose lifestyles and manage privilege become central to an exploration of inequality conducted from the point of view of consumers themselves. Based on her interviews, Sherman argues that the very desire to inhabit wealth in the “right way”-for example, by working hard, avoiding ostentatious consumption, donating money, volunteering time in the community, and raising unentitled children-serves to reinforce structures of inequality. In the American context, the prevailing notion of a behemoth middle class that encompasses an enormous swath of the population also elides inequality. Several of Sherman's subjects referred to themselves as part of the “middle” or “upper-middle” class despite the fact that the majority earned at least eight times the median annual income for New York City, which hovers near $50 thousand. She clarified that wealthy and affluent individuals “don't actually want to live in the distributional middle.” That is, they don't want the standard of living that the median income would afford. “But they want to be symbolically in the middle,” she said, “which, I argue, means to be hardworking, reasonably consuming, and giving back to society.” She finds, for example, that individuals who can more easily tie their wealth to earned income feel less conflicted, while wealthy inheritors or unpaid stay-at-home spouses of high earners have to work harder to feel like they are working hard. But people in all these categories think about their lifestyle choices as meeting basic needs, such as housing and education, eschewing “over-the-top” consumption. Sherman notes that the “Protestant Ethic,” foundational to Americans' ideas about moral worth, “mandates disciplined consumption as well as hard work.” In doing so, it stipulates rules both for how one should work and how one should reap the rewards of that work. The problem arises when society sanctions these kinds of “good” acts and affects with respect to wealth, while casting judgment on “bad” behaviors. “It seems counterintuitive,” Sherman said, “but our judgment of wealthy people as out of touch, materialistic, greedy, lazy, snobby-any of the millions of negative things that we say about them-actually legitimates inequality.” Put differently, it becomes acceptable for individuals to be rich and to ignore the underlying implications of inequality, as long as they inhabit their privilege correctly. In Sherman's view, it is less productive to judge the feelings of wealthy individuals, if such judgment comes at the expense of a capacity to analyze structures that facilitate wealth disparities. This argument demands more work on the part of readers, even as Sherman said that conducting this research demanded an unexpected kind of labor on her part. In the former case, Uneasy Street turns analysis on readers themselves, asking them to consider the social conventions that impel them variously to judge or sympathize with certain kinds of wealthy individuals. In the latter, as Sherman crafted this argument, she describes the energy necessary to resist the adoption of a voyeuristic or judgmental posture with respect to her subjects. Partly for that reason, she notes, this was the most difficult research she has ever undertaken. It bears mentioning that one of the pleasures of Uneasy Street-and one of its most intellectually generous aspects-is the degree to which Sherman is willing to admit the difficulty of freeing herself from the very structural conventions that she describes and suggests that we all must subvert. Uneasy Street does not contend that rich people are deserving or undeserving of our sympathy, scorn, sarcasm, or envy. Rather, Sherman argues that a better understanding of the affects and actions of the wealthy, and the social responses that they elicit, should inform our discussion about the ways that these cultural processes perpetuate inequality.